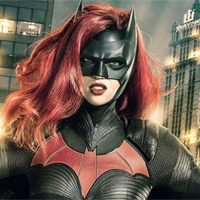 The pilot order comes six months after The CW revealed a Batwoman TV series was in the works and weeks after Rose made her debut in the Arrowverse "Elseworlds" crossover. According to The Hollywood Reporter, Batwoman "was widely expected to be picked up to pilot and remains a front-runner for a series order given the auspices attached (and that The CW's Arrow, now in season seven, has begun to show its age)." Batwoman would mark the first-ever superhero series led by a lesbian character, played by the openly gay Rose. The pilot will be directed by Game of Thrones director David Nutter, who helmed the pilots for The Flash and Arrow. Here's the official logline: "Armed with a passion for social justice and a flair for speaking her mind, Kate Kane (Rose) soars onto the streets of Gotham as Batwoman, an out lesbian and highly trained street fighter primed to snuff out the failing city’s criminal resurgence. But don’t call her a hero yet. In a city desperate for a savior, Kate must overcome her own demons before embracing the call to be Gotham’s symbol of hope."